This is the best/least frightening iteration of Foxy I’ve seen! It could be set in the 1980s before the crew started to really rot. That’s what I was going for. Foxy in the past was he was still new and undamaged. had enough nightmares with that game to last a lifetime. My boyfriend bought it for me…I swore I’d NEVER play it…lasted ten minutes and made it through the first night- after a good ton of chest pain eyeballs popping out pain and fear- then my game crashed and I haven’t played it since. My younger sibs watch over my shoulder as Bonnie nearly got me right before 6am with 2% power….Their faces were priceless! HAHA. Maybe I shouldn’t overthink it, but how are Foxy and Harvey friends exactly? Okay, so he’s always been ethereal right? I mean, he’s an “Elder God” not a ghost, right? I’ve got a whole story that explains Harvey and Ness’s origin. But until then, it’s enough to know that Harvey was once alive. You are not missing much, the uprights are better. Yeah, it was all over the place. I remember one in a laundromat near where I grew up. 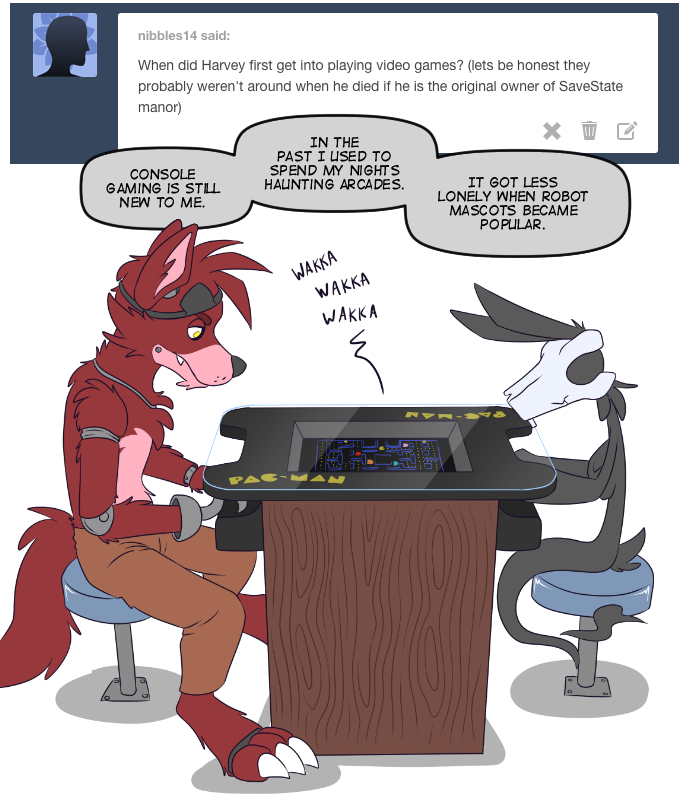 Wow, so Harvey was gaming buddies with haunted animatronics? That neat. Curious as to his favorite arcade game. Neat rendition of Foxy, by the way. Been coming across some rather nice interpretations. I don’t play videogames anymore, but I used to love those tabletop games! Centipede was probably my favorite.